Before we say any more, let's be clear about the bigger picture. This topic is speaking directly to our digital footprints we leave in a digital world as digital citizens. We are talking about student and teacher interactions in public places. Read more about student digital footprints http://ow.ly/yXRH9. We are talking about teachers as professionals who are starting to broadcast and profile their professional interests in public places. See the hashtag for your interest community(ies) especially under the "Educator" tab: http://www.cybraryman.com/chats.html. In this deck we are talking about how it is when you participate into the arena of public "broadcasting" through the following 10 social media spaces, you have an opportunity to amplify your good ideas or squander your influence. In a very real sense you are unveiling your "brand". -Read more about teacher branding http://ow.ly/yXTLi. -Read about the considerations of a new-to-Twitter teacher and making profile choices that will help develop your brand (ultimately not compromising your brand by talking about what you "ate for lunch") http://ow.ly/Bqlst. This deck is built on the premise that social media spaces are public ones that reflect all the diversity one expects with the general public--and that diversity needs filtering by educators--who protect. Educators need to investigate the premise and possibilities of apps, their contents, their networks, their diverse uses--before bringing them in front of students. Even seemingly innocent search terms can result in unpleasant surprises. Teachers have a gatekeeping, protective role to play as they model appropriate use of the World Wide Web and Internet. Teachers need to get "background checks" on the tools and resources they wish to use with students. Some educators remain skeptical or even resistant to the adoption of social media in education; others are undecided, needing details about the benefits for students or the techniques required in order for an app to be implemented in a learning setting. Some educators are prepared to wait while security and privacy issues around social-media-in-education become standardized. Some educators embrace social media in their practice and wonder how the author of this deck could have missed this or that application. It is true that in a world of apps, we have a tendency to adopt one that has been made understandable to us first, or one that grabbed our attention because it did something that the others would not do, or one that the media said was a rising star... . This deck is subject to these motivations for selection. For the undecided, curious, or enthusiast, "collector lanes" are provided with detailed notes explaining how the application can be used by teachers and students. You are in this lane now. The author of this deck is a teacher-learner and has evergreened this deck once already (version "2" was in the previous title). The author is also a parent. The first publication of this deck was decidedly of an overview nature with an optimistic stance toward social media. The second edition added details for parental involvement (see the next slide) and intentional safety contexts for parents and teachers. This third version takes up more of the practical concerns of social media use in schools and where possible, links to promising practices. Social media holds incredible potential for sharing and collaborating with authentic audiences. Schools have to take a cautious approach but not from the sidelines. Let's be clear. Most great ideas can be supplanted. The use of social media with your students could have unintended consequences. Luckily, you would not be the first to encounter surprises and most of the tools have protection mechanisms to which users can resort (please see how this plays out in the next slide about Twitter). Someone has used the analogy of restaurants and steak knives to make a key point about social media and students. Because someone might do some harm with a steak knife, should steak knives be removed from restaurants? The answer seems implicit enough; good things can be misused by a few. Let's extend the analogy; just as a parent would not allow a child to negotiate a steak knife on their own, so ought schools to have strong guided use of social media tools. Social media tools amplify thought. Educators have always been more than interested in students' amplified messages, their learning, their display of talent in learning fairs, bulletin boards, Christmas concerts, etc. We have always believed in authentic audiences, and making students look good, both from a distance and close up. - with the same care & concern for quality controlled we have always taken when promoting school affairs to the public; students will take note of the educator's thinking about "brands" with language such as, "that will make us look good"; "the reader might say, 'so what'? "; "that could be taken the wrong way!" - for safety in virtual public spaces (eg. much like we attend to safety on physical field trips); student may need a buffer zone-- the educator hiding, or better yet softening and explaining the blow of disrespectful feedback. - asserting that schools are in a good position to systematically model intelligent use of digital tools for lifelong citizenship--minding the gap between virtual and physical worlds, "where the private is now public; the local appears globally; information is entertainment; consumers are producers; everyone is an expert; the socially isolated become part of an enormous community preferring the virtual to the real" (Brockman, 2011). Read more of Barry Smith' chapter, in the book edited by Brockman, "Is the Internet Changing the Way We Think?"). See the book https://www.harpercollins.com/9780062020444/is-the-internet-changing-the-wa.... With the educator "social-media-ing aloud" students can observe the thinking of an experienced and trusted adult as various applications, posts, links are assessed and curated during active, collective (initially and longer) use on behalf of the class' endeavors. - maximizing the opportunities that very-engaging media affords. In 2013, Canadian students reported more than 3000 different favorite Web sites with 75% favoring YouTube as their top site followed by Facebook at 57%. And Google at 31%. Read more http://ow.ly/zuybh. Teachers should model and administer these platforms for and with students. While projecting through a whiteboard or digital projector, teachers can "think aloud" or "compute aloud" while posting group work to Flickr for example, or tweeting a link to a news story about new species migrating north--modeling sophisticated, decision-making while using these platforms. Day after day students can have input into how their class is "branding" their work and expertise to the world--learning how to be a digital citizen. Yes, educators need to be users. Our attention often focuses on misuse of these tools, when student privacy is put at risk and school and home boundaries blur. This is not thinking from a position of strength and growth. To conclude these important thoughts and prepare the way for the tool descriptions in the slides that follow, we should look at some possible scenarios. SCENARIO #1. A friend took an unflattering picture of a classmate in a fun setting during a school friend trip. It was funny at the time and both laughed. The friend posted it on a social media platform. The next day, the two friends reflect on the events from the day before. It was a good laugh again. But by the end of the week, so many other people were laughing at the pic that the incident created a newer and less funny event; being laughed at by acquaintances or even strangers is different than laughing with a friend. The friends decide together what to do, if anything, with the pic. They decide not to use Facebook but share it with a few mutual friends via email. See this dilemma played out by watching an animated story http://mediasmarts.ca/game/top-secret-grades-6-8 (will not play on iPad). SCENARIO #2. A heritage fair brings the very best out of a student who wasn't engaged with traditional classroom lecturing and note-taking. The student argues for formal and political redressing of the injustice done during the Acadian Expulsion in 1755. The student demonstrates historical thinking concepts. The student's teacher takes a picture of the student and her display and posts it to the school's Twitter account. The student's single parent learned about the public photo and was upset about the breach in family security, now being in the middle of a custody battle. Although the release forms signed in September included photos, that was before the family crisis. The signed form that gave the school permission to use the student's image and intellectual property was a great starting point. Schools only ever use the very best portrayals of students in publications and communications. Because use of media is infrequent and effective, the school invites parents to celebrate the events and images of students involved in them, first in a school or classroom setting before giving the nod for publishing to the general public. SCENARIO #3. Students were encouraged to purposefully use the classroom's teacher-regulated social media accounts. Among them was one Twitter account the teacher set up with an online classroom email account. Various students were assigned posting privileges because they demonstrated their understanding of the criteria for an effective tweet. However, one such trusted student, tweeted about the teacher's rare but frustrated moment with a non-contributing student that morning. This unfortunate interaction had no place in the public sphere. Ramifications and damage control followed. Although the teacher had parental signatures on each student's Twitter "Certification Form", and three months of uninterrupted networking had been conducted within the #goodcommunityrelations hashtag, the teacher did not anticipate serious lapses in student judgment. To save time, the teacher wasn't using the full gatekeeping measures planned for the young Tweeters. Even though she logged into the account for student users, she didn't always see the 140 characters before these were tweeted. If she could have foreseen this event, she would have started over in September using a PowerPoint template of a fake Twitter account https://ichooseawesome.wordpress.com/2013/04/17/choose-a-fake-twitter-templ...; or Google http://blogs.henrico.k12.va.us/jpcovais/2014/11/06/twitter-template-for-stu... or Word template http://ow.ly/zuElk for tweets with which students could practice their passionate interests. For a better understanding of how much can be said in 140 characters, she would direct students to use a free character counter (see it http://ow.ly/zuHp6). Once each student had settled on their Tweets, she and the students post them--under both teacher and student's watchful eyes. Also, early in the year, the teacher would actively incorporate learning about Social Media into Social Studies citizenship lessons and integrate the impacts ELA concepts of communication, artistry, and collaboration have on relations with others. The teacher familiarizes herself with the issues by first reading two blogs written by a social activist 16 year old, that she later assigned students to read. Read the first entry--an impassioned plea for schools to teach social media http://mediasmarts.ca/blog/social-media-classroom. 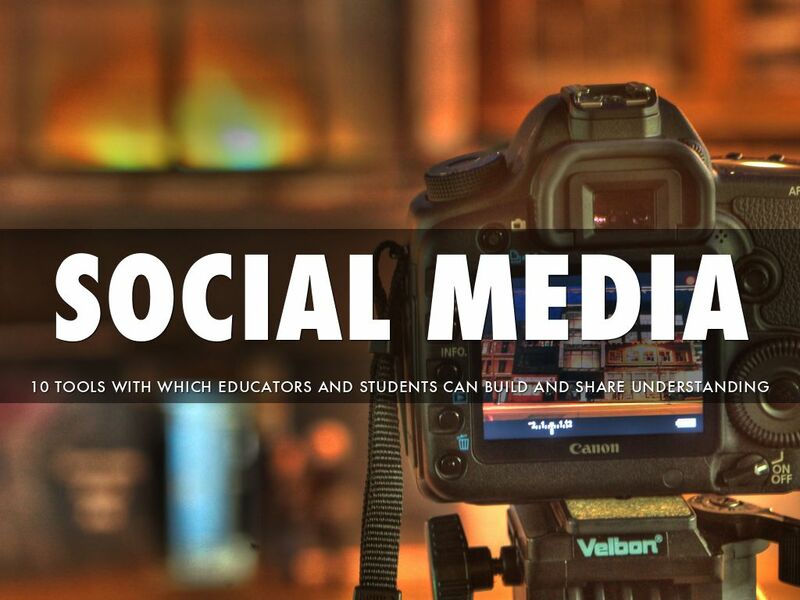 Read his second entry that provides examples of learning amplified with social media http://mediasmarts.ca/blog/incorporating-social-media-your-classroom. Read another blog post of his that provides tips of how to use social media with your future in mind http://www.huffingtonpost.com/patrick-mott/teens-social-media_b_3486924.htm.... The teacher would depend heavily on a new resource for teens called, "Think Before You Share." See the context for it http://ow.ly/yXdgU. The school would actively support parents as well with online resource tip sheets. Read it http://mediasmarts.ca/sites/mediasmarts/files/pdfs/tipsheet/TipSheet_Social.... The administration would support both teachers and parents by holding evening workshops on various topics such as cyber bullying, online safety, authenticating online information, etc. See these described in detail and how to license them for your school http://mediasmarts.ca/teacher-resources/licensed-resources/web-awareness-wo.... Also take a look at New York City Schools' new Social Media Guidelines http://ow.ly/zzXWf referenced in 6 Tips to Keep Your Kids Safe on Social Media http://ow.ly/zzX1O . -We Know Bullying http://ow.ly/yYw1u. Notice the effective use of student work without identifying their faces or last names. Their voices are powerful. All of the social media tools in this deck should be viewed through a lens of digital safety. We are talking about putting education "out there" in public places. The fact that we can do this is incredible. When we do it safely, it's wonderful. People who follow you should be thanked, helpful tweets that should be broadcasted to your followers should be "Retweeted"--and all kinds of other functions and "Twitterquette" can be learned. "Tweets" can be embedded in your wiki (see a sample http://twitterpdconversations.wikispaces.com). A Twitter "feed" or stream of tweets by hashtag or usernames, etc. can be embedded as a widget in your wiki (http://mediasmarts-k12-nwt.wikispaces.com Note: the wiki may not be optimized for tablet viewer), Web site, and blog, extending the "broadcasting" of helpful information. Learn more about Twitter in education https://storify.com/blakewile/twitter-for-education. Watch a short HaikuDeck about teachers and Twitter http://ow.ly/BiPHY. WHAT IS TWITTER'S VALUE TO EDUCATION? If you are already sold on Twitter' s use in education, go straight to the Further Learning section at the bottom to see among others, one very active Twitterer's tips on how to integrate Twitter in education, Alice Keeler. Teachers should use Twitter for professional development. You may find that you'll read more than usual as you follow up links, explore discussion groups, receive thought-provoking, forward-looking inspiration. Eventually you may find yourself understanding something better or differently as you get to the heart of the matter in only 140 characters! Each day someone will tweet something that you may decide to curate toward a topic you are studying or "Storifying" (see that slide in this Haiku Deck). You will receive recommendations in your email for who to follow based on your interests (eg. the author of this deck follows @marcprensky and participates in the #edtech group; you name it...). As you regularly participate by reading the tweets of those you follow, you will want to start contributing yourself. Soon others will be following you. Thank them. Join a network of Twitterer's by participating in a Twitter chat. Consider the Twitter networks you could join. Teachers should use Twitter for student learning. Students can make their understanding of a topic available to the world, hence an authentic audience. This is done by including their Tweet in a relevant hashtag group (eg. #smallcommunity) or creating their own group (eg. #nwtleader). Twitter could be part of the criteria for an inquiry. This criteria could be co-created to include: number of Tweets on topic, number of valuable Retweets, number of conversations had with other relevant Tweeters, number of pertinent links shared, number of appropriate groups included in a Tweet, number of relevant images uploaded, etc..
Also very creatively, Twitter is being used to tell stories. Explore these at TED talks (Andrew Fitzgerald "Adventures in Twitter Fiction"), at http://ow.ly/rX4ux . B) Children 13 and over can create an account subject to the school's acceptable use policies and parental permission. However, it is highly advisable for students to create their accounts at home under parent supervision of the information requested for membership. C) The teacher starts and maintains a classroom account with a specific persona and brand. The persona should be of a formal, educative, professional voice. That voice will Tweet observations, learning, links, and conversations with others within that virtual interest community, over the years and across the coming and going of classes of students--as long as that teacher wants to maintain the account! That voice will "sound" youthful quite often because the teacher is a coach of younger learners who will participate in Tweeting. This may be complex at first as one tries to meet the persona's criteria of being formal, educative, and professional. Words and phrases such as "we", "the students", "our group" will likely appear often. Or in Twitter's 140 character environment, subject words may often be dispensed with in favor of directly beginning with verbs, "Discovered...", "Noticed...", "Questioned..." Of course Retweeting is easy enough, as well as announcing information by including links. 2) the link (which may not work on your tablet) https://www.wind-watch.org/news/2013/07/09/one-turbine-approved-at-whynotts... was shortened to http://ow.ly/25pf303b5Vg (by using a URL shortener called ow.ly) for the purpose of reducing characters. The shortened link itself was shortened further by dropping the http:// for aesthetic reasons although it didn't lessen the character count. 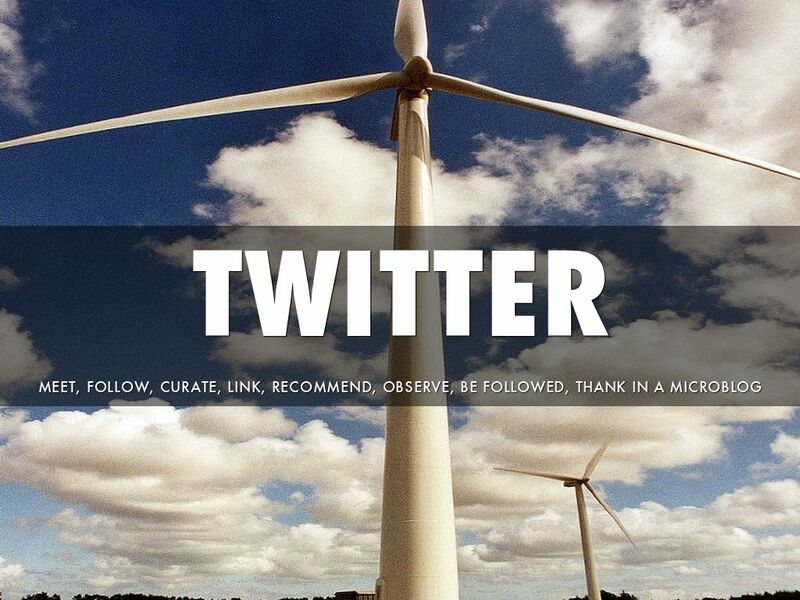 3) the first and second hashtags (#windturbines #energyefficiency) are the specific virtual community of people (find them through the Twitter search field) interested in everything to do with wind turbines and better use of energy. You and your science students might want to be a voice in those communities. Members of those communities may follow your brand (account, identity, etc.) on Twitter because you have such helpful Tweets. They do this by pressing "Follow" when visiting your account. All accounts begin with "@". Perhaps your account is @paws4science or @sciencehere or @weknowscience, or whatever best and cleverly identifies your brand. a. Your followers see your helpful mentioning of @SNSudents . They may want to explore and follow that brand as well. b. @SNSudents sees you as someone who mentioned them and may check you out and decide to follow you. If that happens, you will show up in their list of followers that everyone else sees. Others who respect @SNSudents may follow you just because @SNSudents follows you! c. @SNSudents may decide to Retweet your Tweet to all their many followers, thus getting your helpful brand out there for more potential followers and conversations. 6) Finally, the necessary credit is given for the use of the picture attached to the tweet in the form of a shortened link back to the picture within the author's Flickr photostream. D) Plan for full gatekeeping and educative measures for student Tweeters. As mentioned on slide 2, start in September using a Word template for Tweets with which students can practice their passionate interests (download it http://ow.ly/zuElk). For a better understanding of how much can be said in 140 characters, direct students to use a free character counter (see it http://ow.ly/zuHp6). Once each student has settled on their Tweets, post them--under both teacher and student's watchful eyes. 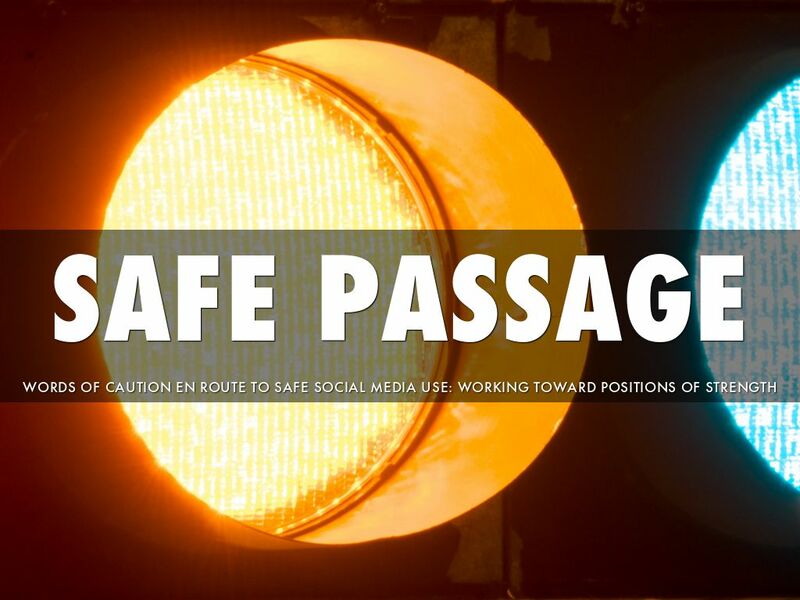 Perhaps use mock Twitter accounts already described and linked in the "Safe Passage" slide (2nd slide) of this deck. E) Start small. Let's back up a bit. Teachers and students do not have to have an account in order to read Tweets within a community (#) or to read what an individual is Tweeting (@). Twitter can be a research tool by using the magnifying glass in the top right corner at Twitter. Troll the Tweets for links that Tweeters provide. You simply wouldn't have the time to find all the good information (blogs, news stories, Web sites, etc.) out there yourself--but the hashtag ' group' has the time! You only need an account for when you decide to start participating by "Tweeting." F) Encourage the school board to embed significant student and teacher tweets on the district's Web site or the principal on the school's Web site. G) Learning can be communicated to a live audience (eg. class, staff meeting, assembly, etc. ) by projecting the tweets and conversations through any Web-enabled device. 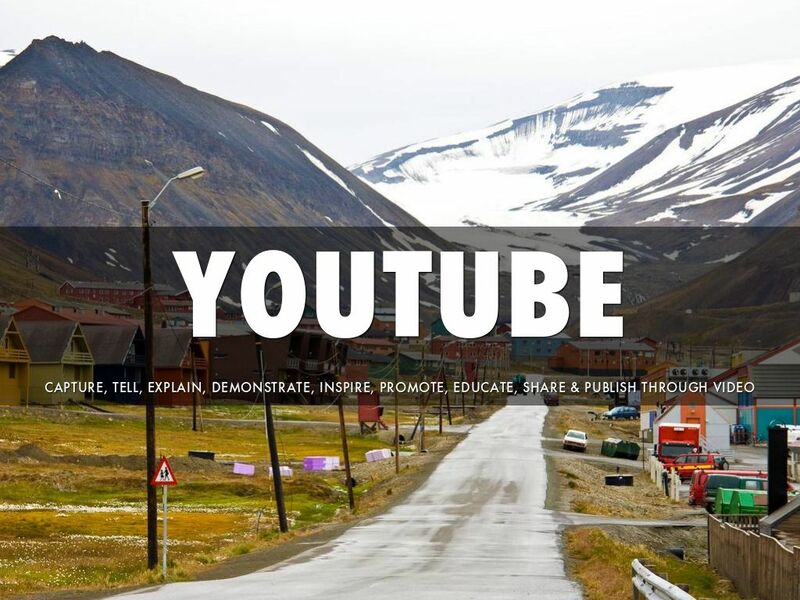 YouTube is a video sharing site that allows a user to upload original video tutorials, stories, documentaries, etc. These videos can have a short description and provide several ways of sharing through an email message, a link, and embeddable code for your blog, wiki, or Web site. What is its value in education? Students can make their understanding of a topic available to the world (hence an authentic audience) by embedding another person's YouTube video as an illustration in a wiki, blog, or personal Web site. Or/and they can create their own video with smartphones, tablets, or camcorders, edit it with software like iMovie or Windows Live Movie Maker (or right in YouTube itself) and upload it to YouTube. Marc Prensky once said video is the new essay. In video, students can show how cats sleep anywhere as they narrate Eleanor Farajeon's poem by the same title. Students can narrate video of the effects of less sun exposure on vegetation that grows on a north facing hillside. Narrated video of Aboriginal government buildings and their signage can be shown to illustrate the power and effects of nationhood, self-government, and land claim agreements. YouTube will ask them to create a google account by providing an email or inviting them to have a Google gmail account. The username you sign up with becomes the name of your YouTube channel (the grouping of all the videos you upload). If you are a new user, test the usefulness of YouTube videos by looking at some examples at youtube.com. Use the search field at the top to explore a topic of your choice. A) Children under 13 are not to create a YouTube account because of privacy issues. C) Start small: there will almost always be a student who would benefit from capturing, editing, and publishing a curricular related video during the school day. If the teacher cannot provide the support the student needs, reverse the roles and ask the student to learn the portion of the task they at first don't know, and then share the process with the teacher. That student can become the mentor to other students and teachers in the class or school. D) Encourage the school board to embed the video on the district's Web site or the principal on the school's Web site. E) Learning can be communicated by projecting the video presentation through any Web-enabled device. Flickr is a photo sharing site. Some would say it is the YouTube of image sharing. Flickr hosts many publicly owned photos from around the world called, "The Commons" along with other interesting commercial collections. Many millions of images are also made available under Creative Commons (cc) licenses. These images are organized according to the six types of cc licenses. Creators choose which license they want to donate their photo to the world under when they upload their images. These images are directly searchable by license type at the flickr.com/creativecommons page. They're also available from the general search field-- enter in your search term, say "blueberries", use the adjacent "Advanced Search" feature to categorize the blueberry results. The last category there searches Creative Commons images that can be used commercially or those that you can "modify", "adapt", "or build upon." Double click on the image of your choice, select the "View all sizes" choice in the bottom right 3 dot menu (***). There you can access the photo for downloading, the "some rights reserved" license, and the creator's username--information that you need for attribution in fulfillment of the license requirements. With so much Web 2.0, user-created information increasingly available, students need to learn the skills of curation, authentication, licensing, and attribution. Particularly with images, it's more than just making a bibliography for the photos you used--it is also knowing about and respecting the rights the creators have given up--and retained--in order to share. Flickr makes it easy to learn about whose intellectual property (IP) you are using and what uses you can make of the image according to the cc license. At school, teachers can demonstrate the personal importance of IP by getting students involved. What better way to learn about intellectual property and licensing than to share some of your own photos within Flickr? This IP awareness is helped along with Google images as well, by filtering with the gear tool in the top right > advanced settings > usage rights -- to find various kinds of shareable images. A) Yahoo, the owner of Flickr does not contact or ask for more information from children under 13-- than what is necessary. From a school perspective, children under 13 should not create Flickr accounts because of privacy issues. Work can still be done under teacher supervision using a teacher account or an account created by the teacher for the classroom. C) Start small: Students do not have to be logged on to any account to download Flickr images, but must be in order to upload images. Maybe the class wants to donate their images of the recent culture field trip they took--images that are not of individuals but of whole groups, landscapes, animals, performances, etc. The teacher can create a couple of online email accounts for school use. Designate one or two computers/devices for Flickr, leaving them open to the classroom accounts. Just be aware, the username you create for the Flickr account will be the name under every image in the "photostream" (listing of your images). Therefore, make the username intuitive, inclusive, and multidisciplinary to reflect all kinds of inquiries the class will conduct--and your classes in the future (eg. schoolknowledge, schoolview, classperspective, etc.). Upload only your best work. Each photo that is uploaded can be named and briefly described. Tags should be provided to make the image searchable. Even more importantly, a Creative Commons license can be chosen for each image. The idea is to make the image shareable with "some rights reserved". The default license is "all rights reserved" which may defeat the classes' good will to meaningfully share. D) Haiku Deck, a presentation app, and another slide in this deck, works in partnership with Flickr to automatically make Creative Commons images available with automatic attribution. E) Learning can be communicated by projecting the classes' photostream on a screen, explaining to a live audience how each image grew particular understanding. Storify is a service that allows a user to easily search Web resources using the handy search field for common social media services (Flickr, Twitter, YouTube, Web links, etc.) and then drag them to a working area, rearrange and label them according to the "story" you are telling in the field you are exploring. Each Web source comes automatically with a visual to make the reader's experience richer. Just click on the links to visit them or play the videos, etc. When you are done editing your story, simply "publish." You have choice over how this is done. If you are a Twitter user, a tweet is automatically created that includes a link to your story. Stories can be edited after posting. Perhaps what makes it a great curation device for students and teachers is how it functions as an area to collect thoughts, like a workshop where things are constructed or an anchor chart that reflects the development of an idea. As students learn to use search engines and domain finders to find and authenticate Web resources, they can be "Storifying" their results as they go along. They may be in pursuit of family customs in the circumpolar world and group these sites by countries, seasons, latitude, etc. Antioxidant foods can be arranged by seasonal accessibility, by color, by those dirty from pesticides, etc. Web sources on a particular animal from the endangered list can be collected and sorted according to ratings in the media, science research, indigenous knowledge, etc. Your work is saved as you go along until you decide to "Publish" your story. But until that time, you can weigh each resource on your topic and place it under a temporary title you assign. For example, as a student researches geology, they can move "Glacial Lake Missoula" information around to match whatever titles they have have made to that point--or make a new title (eg. "quick changes"; "catastrophic events", "new theories", etc.). Test the usefulness of this out by looking at some examples at storify.com. Use the search field at the top to explore a topic of your choice. A) Children under 13 are not to create Storify accounts because of privacy issues. Work can still be done under teacher supervision using a teacher account or an account created by the teacher for the classroom. D) Storify can serve as a dynamic, annotated bibliography, with students choosing and arranging Web resources by topic-subtopic, main idea-detail, according to the criteria of the inquiry. E) Learning can be communicated by projecting the story on a screen, explaining to a live audience how each source grew her/his understanding. And of course, by pressing the "Publish" button, a worldwide audience can enjoy the story. Storify provides data on the number of views each story receives and how many viewers follow the account. Stories can be edited throughout the year. This quality encourages students to pursue learning not as a series of one-off assignments for someone else but as a personal endeavor to maintain their own learning enterprises and networks. Social bookmarking is a service that allows a user to bookmark and save a desired Web resource online (eg. Bookmarking services include Diigo, Delicious, etc.). By assigning keywords or metadata called "tags", and adding a brief description of each resource, other users can search all his/her bookmarks--or all bookmarks of users around the world who used the same tag. A visual automatically comes with most bookmarked Web sites to make the searcher's experience richer. Just click on the links to visit them or play the videos, etc. Others can save these bookmarks to their own accounts. Similar to Storify, it a great curation device for students and teachers. It functions as an area to collect thoughts (keywords or "tags") like a workshop where things are constructed or an anchor chart or a growing synthesis of a concept. Unlike Storify, there are no titles or subtitles; all categorizing depends upon effective and consistent use of tags. For examples, students individually or alone could be responsible for finding, authenticating, and bookmarking resources during the study of renewable energy sources. For each Web resource, all students are responsible for using "renewable energy" as a common tag, in addition to a tag for their specifically chosen areas: "solar", "wind", "geothermal", "biofuels", hydropower", "ocean", etc. It should be noted that Diigo provides additional annotation features such as being able highlight text and leave sticky notes on the Web resource. These features along with a few others might make the difference between an educator wanting to use Delicious or Diigo for student inquiry. A) Children under 13 are not to create Delicious accounts because of privacy issues. Work can still be done under teacher supervision using a teacher account or an account created by the teacher for the classroom. C) Start small: The teacher can create a couple of online email accounts for school use. Designate one or two computers/devices for social media such as Delicious, leaving them open to the classroom accounts. This account could be named some overarching name that would include multidisciplinary work with multiple students throughout the year. That name will become part of the URL. 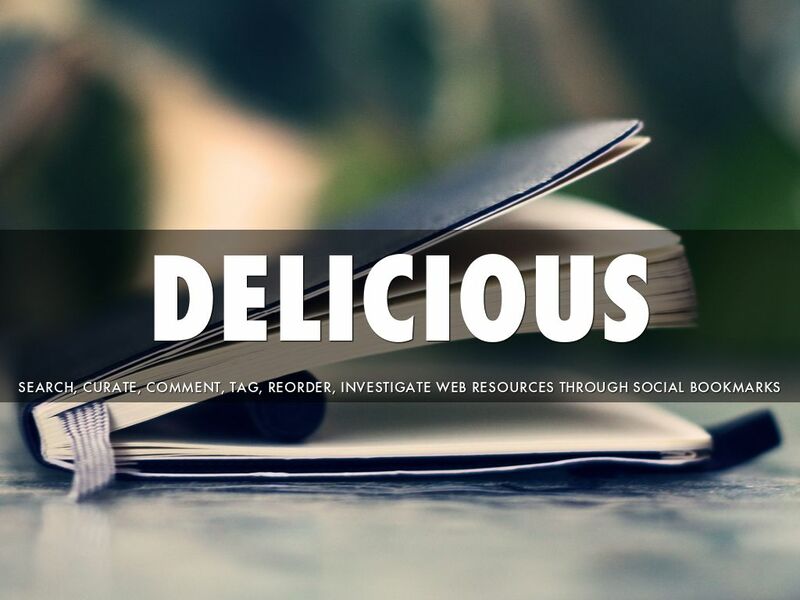 D) Delicious can serve as a dynamic, annotated bibliography, with students choosing, labeling, and tagging Web sites according to the criteria of the inquiry. E) Even though you cannot create separate files or sets of bookmarks for individuals or groups of students as you can with Storify, the teacher can set criteria for the inquiry that requires use of a particular tag or tags to identify the topic or subtopic--tags that would identify a particular person's or groups' work within the classroom's Delicious account. These tags could be curricular topics such as "faults", "folds", "plate tectonics" for the units of study in earth science for example (explained earlier). F) Learning can be communicated by projecting the individual/group bookmarks, explaining to a live audience how each source grew her/his understanding. And of course, a worldwide audience can enjoy the links as well. These links can be edited throughout the year. A visual bookmarking service. Social bookmarking is a service that allows a user to bookmark and save a desired Web resource online. Visual bookmarks go a step further in displaying the Web resource as an image (eg. Pinterest, eduClipper, Learnist, Zootool). Pinterest may be the YouTube of visual book marks. 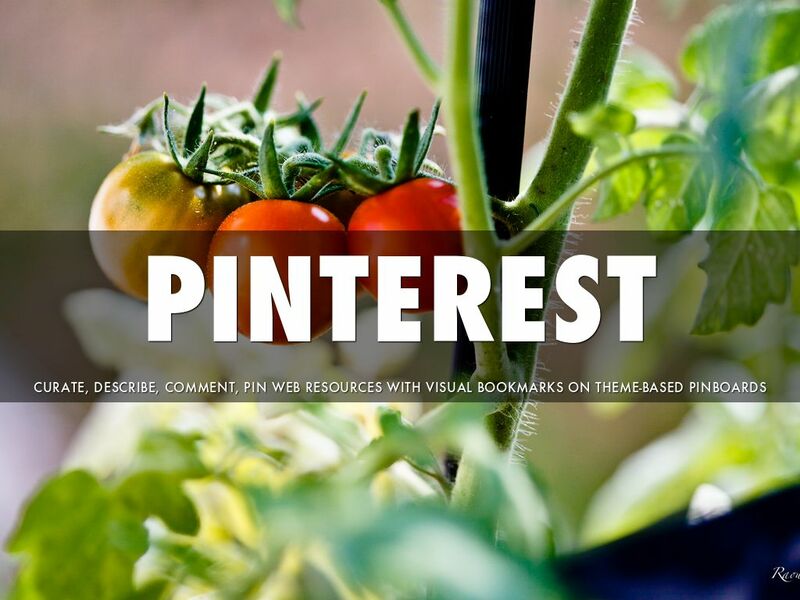 Similar to Storify, what makes Pinterest a great curation device for students and teachers is how it functions as a workshop where things are constructed or an anchor chart that reflects a growing synthesis of a concept. A topic is called a board; the Web sites pinned there are like subtopics. The creator can comment on each Web site; in a school setting that means justifying its inclusion according to criteria. Imagine being able to show your Web site instead of just providing a text heavy link to it. Perhaps the class is studying ancient societies. After teaching students to find and authenticate Web sites, individual students or groups could be tasked with creating topic-subtopic pin boards": "Ancient societies: daily life", "Ancient societies: cultural expressions", "Ancient societies: contributions that continue", etc. Each Web site's inclusion or "pinning" should be explained according to co-created criteria (frequent practices; infrequent practices with year long impacts"; practices they were known for through ancient world; etc.). In other words, the student and teacher have agreed ahead of time, that each "pin's" (Web site) description box will explain why the site was chosen: "this site shows mealtime, a frequent but important part of this culture because it is a time when ..." etc. A) Children under 13 are not to create Pinterest accounts because of privacy issues. Work can still be done under teacher supervision using a teacher account or an account created by the teacher for the classroom. C) Start small: The teacher can create a couple of online email accounts for school use and designate one or two computers/devices for social media such as Pinterest, leaving them open to the classroom accounts. All kinds of curricular uses can be made of this tool. For example, students could be asked to create a list of healthy foods and comment on their selections according to the project criteria. D) A student's learning can be communicated by projecting the student's/group's pin board topic, explaining to a live audience how each source grew her/his understanding. Because education is increasingly interested in engaging student interests, a particular board can be edited and maintained throughout the year. After all, it's more about student enterprise then academic requirements. Wikis are simple-to-edit Web pages and are good for the development of collective thought. Think of them as tools for a community to "get things right" before cutting/pasting the content to a more formal Web site. Or the wiki itself could be refined as the published form of the work, embedded with videos, avatars (or any other kind of widget) and inserted with pictures and links, complete with a navigation bar to other Wiki pages. Companies that sell wikis, such as wikispaces.com offer various levels of service from free wikis to private label wikis. One great feature of wikis is how their level of openness and participation can be customized (explained below). What is its value to education? Most inquiries require a place to document and display data. A wiki is a place where individuals or groups can logon and conduct work from any location, at home or at school. Three students may be working as a group, for example, on what substances hold the most promise for winter traction on paved road surfaces. One student is responsible for salt, another gravel, another beet juice. The "classroom" wiki the teacher set up for the students will show the specific edits each student did in the wiki; formative support is easy for the teacher to assess. Teachers or classes may want to carry on work privately where only people they make a member can see or edit the wiki--under "permissions" within the "settings", that wiki could be set to "private". Or a "protected" status could be chosen (the world can read, but only members can edit). To benefit from global collaboration or readership, the "public" setting might be desirable (the world can read and edit). 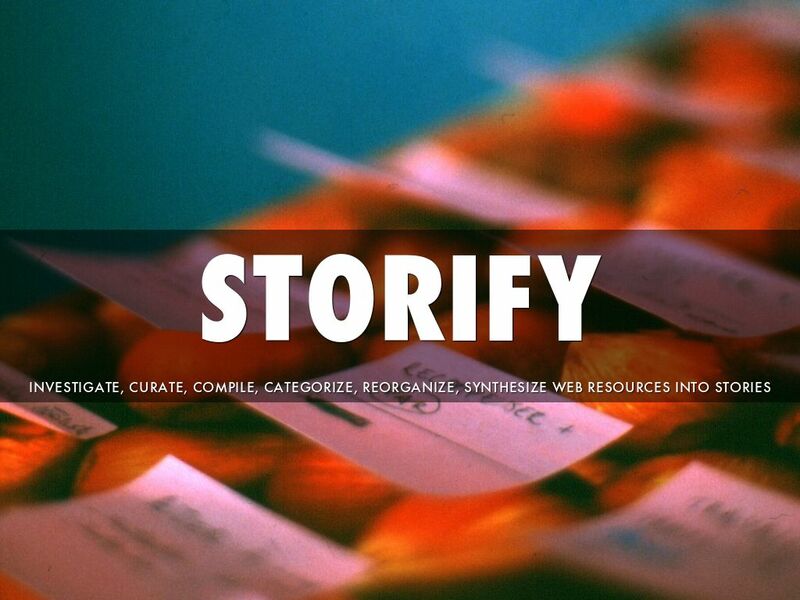 Similar to Storify and other curation apps, what makes it a great curation device for students and teachers is how it functions as a thought-collecting device or space where ideas are constructed or a synthesis takes shape. Links can be inserted to go out to the Web, and files uploaded for others to use (PowerPoint, Word, PDF). Unlike Storify, there are no automatic containers for titles or subtitles; you have to make them--which is easy to learn. Wikis are very friendly to receiving Word processed text and tables. Tables can be created in Wikispaces but act quirkily. Other simple codes can be used to return a viewer to "the top" of the page, to create table of contents, etc. A) Children under 13 are not to create Wikispaces accounts because of privacy issues. Work can still be done under teacher supervision using a teacher account or an account created by the teacher for the classroom. Teachers can assign students email accounts through Wikispaces that only work inside the application. B) Start small: The teacher should get a free educators account and choose under the "general" button within "settings" which kind of wiki is desirable: traditional "wiki" with obvious edit button; "basic Web site" that looks cleaner with the tool bar hidden; or "classroom" with a new feed-comment bar at the bottom of each page to make conversations possible, as well as an assessment tab at the top to see a visual of each student's engagement level in the wiki or the project. C) Wikispaces have been used as the anchor and follow up for face to face meetings or meetings conducted online, starting as an agenda with resources and links and ending post-meeting with the inclusion of collective assets that will go forward for that community. D) Wikispaces are good for student project work-especially group work. As said above, student work can be monitored, formatively assessed, and supported through use of the data feed the organizer of the wiki can see. Wikipedia is the most famous wiki of all; it reflects the collective world-wide thought on a topic. In short, it is what the world knows about your topic. If your topic is not found there, it invites you to write an article for it. This doesn't mean that you should write original research because it would not be accepted by the key core of editors. But it does mean that you should write a careful synthesis, drawing from sources already in print. Even if you were an eyewitness of an event, you cannot use that information unless it has been documented already somewhere else ("work submitted to Wikipedia must be verifiable"). Wikipedia is based on an open source philosophy that encourages the use of shareable images as illustrations--images that often come from Wikimedia Commons or Flickr. Wikipedia is a great starting place for an overview of a topic. It can be a source of great shareable images ("some rights reserved") where the image author states the terms of sharing. Tables and maps can enhance understanding. References and notes are provided at the end of the article for indepth research. To be safe, Wikipedia is not a quotable source for student work mostly because the authority of the anonymous writers is not known--and validity requires authority. While it could be more valid than a single author in a single traditional encyclopedia because it must stand collective scrutiny (together-we-are-smarter philosophy), we do not know who those collective editors are. As a teacher, if you notice Wikipedia is silent on a topic you think has curricular value, this might be an invitation to edit (write) an article. Wikipedia might not have an article on the students' small community, local hero, or landmark. This is an invitation for students to gather documented knowledge, synthesize it in an encyclopedia format look and feel, even creating new images that might best portray the content. Students will be more engaged when they know this work is not only for viewers around the world curious about their community, but also for future generations of their community's citizens. If you think an already existing article is incomplete, this might be an invitation to edit it (expand it with text, images, references, tables, etc.). For example, the Wikipedia article on "Rabbits" does not show (currently) and image of rabbit tracks or trails in the snow. It doesn't speak of how to trap a rabbit in the winter. These are potential improvements that could be made and accepted if done well. 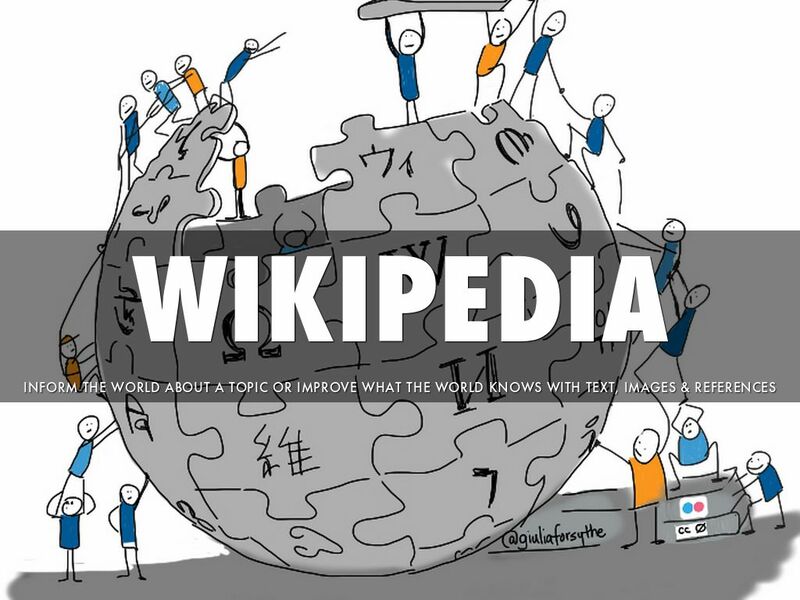 Again, Wikipedia offers a wonderful opportunity for students to take a subtopic, conduct research, write a synthesis, or expand on a topic they care deeply about. The world is the audience as they write about their community, county, region, district, etc. A) There is no age restriction for editing or writing new articles. Simply never give out any personally identifiable information. See the Wikipedia article written for young editors ("Wikipedia: Guidance for younger editors") at http://ow.ly/MnTAo. B) Do not let any student researcher edit Wikipedia without logging into their own account or having the teacher log in to an account he/she created with a new email for student work. By creating an account that the teacher might consider a 'classroom' account, she or he has a 'portal' into to Wikipedia that will transcend the classes that come and go throughout his/her professional practice. Such an account provides a way for student 'shadow-written', teacher-curated work to be published to the world's 'collective brain'. C) In order to know how to help a student once they have logged in to create or edit, the teacher should be a little familiar with wiki text or know how to become familiar. You can do this by simply pressing "edit" on any article and noticing the basic code others have used to achieve the features of their article. For example, to link a word in your article to an already existing Wikipedia article on that topic, use brackets, [[culture]]. To create subtitles, use double equal signs, ==The importance of elders==. D) Learning can be communicated by projecting the Wikipedia article explaining to a live audience how the article came to be or was improved. Links to the article can be published in the classroom, school, or district online media spaces (Web sites, blogs, wikis, etc.). E) Wikipedia work being conducted on "your watch" needs to be closely coached, mentored, monitored, moderated, etc. If even one student makes a foolish comment--considered vandalism in the Wikipedia world--that account could be permanently barred from editing. Haiku Deck is a free online presentation tool for desktops and tablets that emphasizes an image with few words. This whole presentation is a Haiku Deck. You are reading this information because the app allows you to write public notes--a great feature to make this an asynchronous learning asset. Also a hint at the information you might say if you were presenting the deck to a live audience (those kind you would put in the private note section--more on this below). Haiku Deck makes finding photos easy. It automatically taps into stellar images that have been made available for sharing by "Flickr photographers all over the world." And--provides automatic attribution with a little "cc" logo (Creative Commons) in the corner when you tap on it in play mode. Traditional first. Of course students can create a digital presentation with PowerPoint and Keynote. They can find a Google image or Flickr image for those slides and draw a masking box across the image with text in it as well as write a caption with attribution below the image. Haiku Deck does something that these applications don't do--it automates attribution of images. Attribution is a task that needs reminding about and modelling. Students need to determine whether the image is licensed by the creator for such use and then attribute to that creator. Google images can be filtered with the gear tool > advanced settings > usage rights -- to find various kinds of shareable images. Similarly, Flickr images can be filtered with advanced search > Creative Commons -- to view various types of shareable licenses according to all, commercial, or modifiable, adaptable, etc. 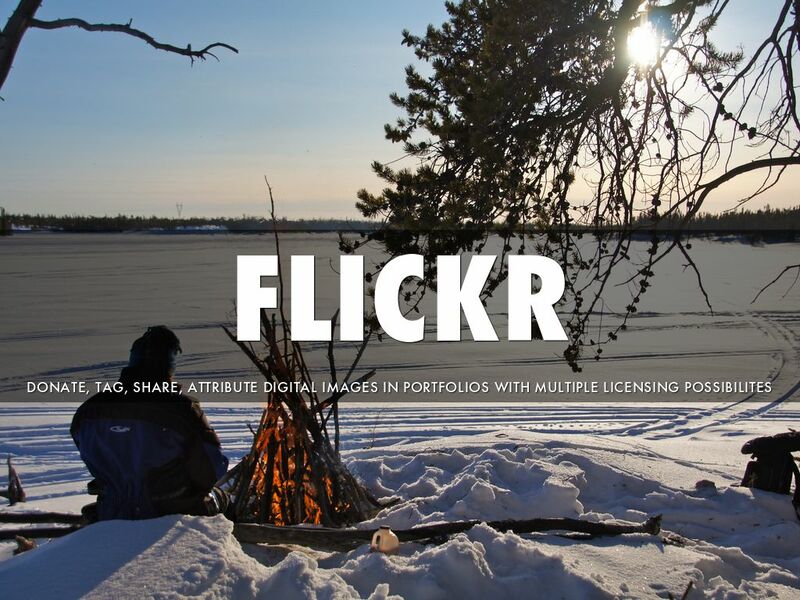 Flickr allows you to pick licenses by specific cc licenses by going straight to the flickr.com/creativecommons page. So how does Haiku Deck's automation of sources work? 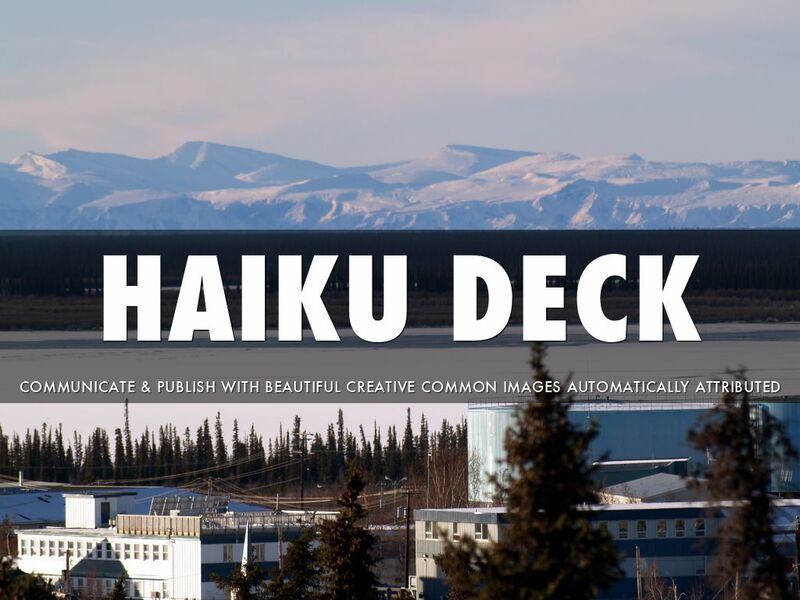 Haiku Deck short lists beautiful images and automatically displays the shareable license for a chosen image with the cc logo (mentioned above). When the logo is pressed in play mode, the creator, his photostream (all his work in Flickr), and the image's license appears. Also Haiku Deck is different because it limits the choices to be made about presentation controls (eg. animations, transitions, etc.) and allows the student to concentrate on the image and brief text--the features with the most punch for viewers. Students can present on all kinds of learning (especially on the topics presented in previous slides in this deck): "What I value about my community"; "Examples of circle use in architecture"; "Why my country is a good candidate for use and production of alternative energy sources"; "How the shipping industry impacts my region"... The list is endless since it reflects the possibilities of student chosen, curricular-related inquiries that can make use of a bank of stellar Flickr images with automated attribution. There is a fly in the ointment though. Sometimes the filter that curates these stellar images, allows a suggestive and inappropriate image through. The school or district's filter may not catch it. The company is working on this and thinking of creating a HaikuDeck for children. Because of this concern, a teacher may want to either look through the returns first on topics the students are studying or create a folder, album, or set of pre-approved images. See http://ow.ly/C5NcT. Or generate the images within the class by using an iPad camera, or other apps as this teacher did about the Titanic http://ow.ly/C5NZv. These are all workarounds that will not necessarily tag the photos with the cc logo. Essentially, these workaround cause HaikuDeck to lose the benefits for student use. While the majority of images are great, one fly in the ointment is too many for this educator to use with students-except when using their own images, without the cc logo. Nevertheless, the application is stellar for teachers who want to communicate professional thought--as this HaikuDeck is doing. If you really like HaikuDeck, and want to voice your opinions about how to make it better for education, please participate in the company's survey for educators http://ow.ly/C5NNN. 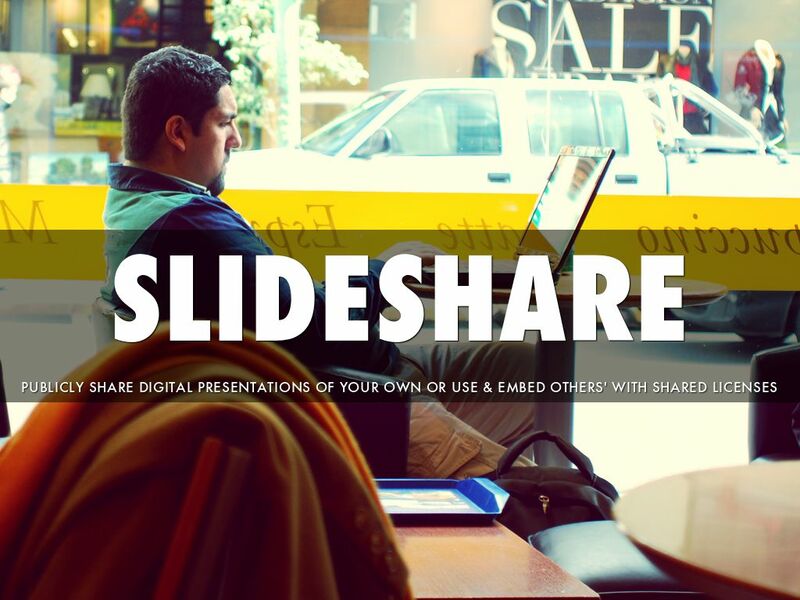 Slideshare is a service that allows a user to upload a digital presentation to a slideshow hosting Web site. The digital presentations are searchable and can be embedded in your wiki, blog, or Web site. Students can make their understanding of a topic available to the world, hence an authentic audience. For example, a 14 year old science student who has created a digital presentation (eg. using Haiku Deck, PowerPoint or Keynote) from their own digital images or shared Creative Commons images while investigating mechanical systems or freshwater & saltwater systems, can upload their learning to a worldwide community using Slideshare.net. Haiku Decks receive airplay in the Haiku Deck gallery but could receive even more attention with Slideshare. Read more about this by googling terms "haiku deck slideshare". A) Children under 13 are not to use Slideshare because of privacy issues. However, stellar work can still be done under teacher supervision using a teacher account or an account created by the teacher for the classroom. 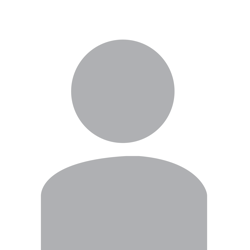 C) As with other student-generated media, no identifiable, individual faces should be displayed in a deck without written permission (parental consent for children under 18). D) As with other student use of images, the type of intellectual property license must be considered when building the original slides. Creative Commons "some rights reserved licenses" (as shown by the millions in Flickr), and public domain images/work are recommended for slideshows. This awareness will prepare students for their adult lives; training about this can be habituated in the grade school years. C) Start small: with written parental consent, reward the best student work with an upload to a world-wide authentic audience within the classroom or teacher's Slideshare account.